​ When you start to study nutrition, you’ll soon find that there are A LOT of vitamins and minerals to memorize. It can seem a little overwhelming, but one vitamin you should definitely be aware of is Biotin. Though this vitamin is often called “Vitamin H,” it is actually part of the B complex groups of vitamins. B vitamins are critical. They help the body convert carbs into fuel, which is used to produce the energy you need to live a healthy and active life. Within this spectrum, Biotin is known for supporting healthy skin, eyes, liver, and hair. That’s why it is a popular ingredient in hair and skin treatments. Early studies also suggest that it might improve blood sugar in combination with chromium. It is important that you get enough Biotin. Pregnant women should also take special care to ensure they take enough of this important vitamin. Our Perfect Health supplement is designed to provide you with all of the vitamins and minerals you need to stay healthy and happy. It includes 18,002 mcg of Biotin. 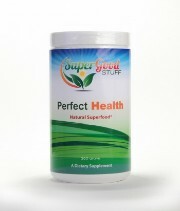 Learn more about our Perfect Health supplement.